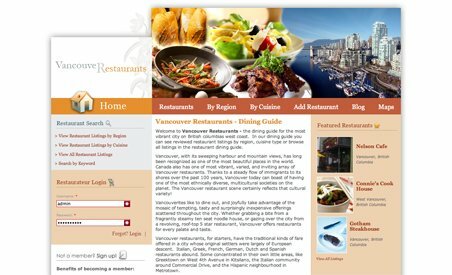 Vancouver Restaurants is an online dining guide for Vancouver, British Columbia. For a small annual fee, restaurants can add themselves to the directory and receive a multiple page listing with a reservation form, photo gallery, user comments, five-star rating system, search engine optimization and free technical support. Users have the option to browse all restaurants, or sort them by location or cuisine type. The website also has a blog, which covers a variety of subjects including food, local news and events, as well as other restaurant-related topics. Whether you’re an out of town visitor or a local who wants to try something different, Vancouver Restaurants will guide you to a delicious destination.